Are you thinking to become a banker? Looking to get yourself a good banking job? But, confused what kind of questions you’ll face in the banking interview scheduled ahead? Don’t worry! We have handpicked some of the best and the most common Banking Interview Questions to ease out your preparation process. Banking is an enticing career option for fresh graduates as well as experienced professionals. Being a banker has its own charm and style. Now, if you have decided to build a strong base in the banking industry, this information shall benefit you. While applying for a banking position in a reputed bank, you are often concerned about the interview day approaching. Right! How to prepare for a banking interview? What are the tips to be followed while doing so? Whether it’s an entry level position or a senior role, a banking job demands the very best of you. So, you’ll be tested for your general and communication skills plus key competencies related to the banking field. Hence, it’s better to equip yourself with all the necessary information before appearing for a banking interview. Moreover, when you have the banking interview questions in front of you, you can prepare your own winning answers to impress the interviewer. And, if you can impress in one go, you can surely capture the perfect job for yourself. What are you thinking? 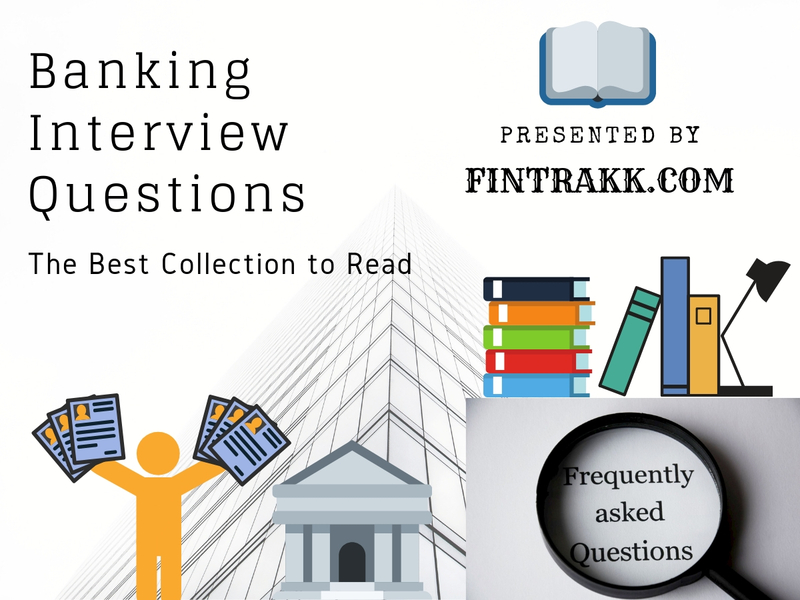 Just scroll ahead and dig deeper into the different range and type of bank interview questions you are likely to face. So, we have put together a set of questions to test your communication and customer behaviour skills. On the other hand, we have compiled a list of specific banking interview questions for checking your technical knowledge. Do thorough research about the bank, its founders, its growth statistics, stock price and any other useful details to excel in the interview. Share factual and accurate information about the bank, if any relevant question arises. This can really help you outshine the rest of the crowd. Check for any particular instances that make the bank stand out from the rest. You can quote the same in a similar query in the interview. You should be aware of any recent deals and the bank’s performance over the years. You can be prompted with any random question from this. Read about latest developments in the banking sector, the current economic scenario and market trends. Tell us about yourself or Walk us through your resume. Why do you wish to become a banker? Why do decide to apply for this banking job? Why should our bank hire you? What are the most important qualities of a banker? What do you think about the banking sector, any major changes you wish to point out? What is are the major needs of a banking industry? How would you convince a person to take our bank’s services? Have you dealt with an angry customer? How did you handle it? What steps should a bank take to promote financial inclusion in the country? Where is the banking industry heading? What significant trends you can visualise for it? Although, there’s no single best answer to these general bank job interview questions. Still, you can prove yourself by giving thoughtful and intelligent answers. It’s all based on your way of thinking and behavioural skills. First and foremost, clear your basics in finance and banking. Don’t miss to go through important basic financial terms. You can have a quick look at the frequently asked questions in a bank interview. Practice them well and grab the banking job of your choice. What is a bank? State different types of banks. What is a commercial bank? State its different types. What is a crossed cheque? What is a fixed deposit? Types of fixed deposits. What are different kinds of loans offered by banks? What is SLR or Statutory Liquidity ratio? What is CAPM or Capital Asset Pricing Model? What is “bill discounting” ? What do you mean by amortization? What is CIBIL or credit score? How does a bank earn profits? What is BRS or Bank Reconciliation statement? How do you prepare it? What do you mean by “cheque endorsing”? Which is the apex bank of India? (Or another country, if you are appearing for bank interview elsewhere). Tell something about NABARD or National Bank for Agricultural and Rural Development (India). What are the various risks that banks are prone to? What are the banking products that a bank can offer? What is NPA or Non Performing Asset of a Company? How will you define NBFC or Non-banking Finance Company? What is money laundering? What are anti-money laundering guidelines. Any idea about it. How can you determine the creditworthiness of an individual or a company? You may also like to explore our exclusive list of Accounting Interview Questions for freshers. A Cheque and a Demand draft. Repo rate and Reverse repo rate. A bank guarantee and Letter of credit. Fixed and floating rate of interest. Gross Domestic Product (GDP) and Gross National Product (GNP). A banking job requires you to be polite and have adequate patience to deal with customers. Your aptitude, dedication and experience combined with an in-depth banking knowledge can do wonders. A personal banker, a loan specialist, a fresher or a senior level managerial post in the banking arena, you surely need to express yourself. This is just a collection of the commonly asked banking interview questions. There might be a whole lot of others as per the particular role that you are applying for. Are you ready for your next bank interview? Don’t forget to keep in mind these best banking interview questions and answers to the same. Feel free to discuss any queries in the comments or join our discussion forum for free.